Since I started officially writing articles on my exploration of Walt Disney World over a year ago, I have always prided my self on one recommendation above all…SLOW DOWN. Today, I am going to tell you just the opposite. 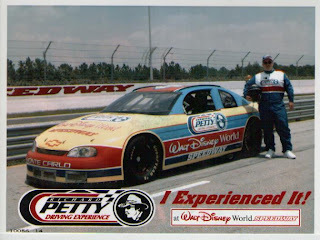 With Disney’s recent introduction of a free ride along at the Richard Petty Driving Experience, I began to think about just how much fun it was to SPEED UP, if only for a little while. 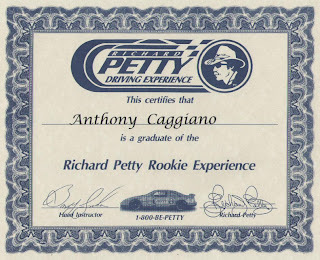 Back in the summer of 1998, I was fortunate enough to have taken part in the Rookie Experience at the Petty Driving Experience. They offer a few different packages over at the Walt Disney World Speedway, this one was one of the shorter offerings, but even at just around 10 laps or so, it was an afternoon I would not soon forget. On this sultry July afternoon, with a temperature approaching 95 degrees, the cockpits of these race cars made it feel like you were climbing down into the depths of Hades. But, once you flipped that switch and heard the roar of the 700 horsepower engines…all of that was forgotten. The driving experience itself was not very long. Including warm-up laps, it lasted about 20 minutes…but it was twenty minutes I can recall clearly, even now, twelve years later. Over the course of my “hot” laps (those other than the warm-up and cool down laps), I averaged a speed of around 119 MPH with a fastest top speed of 128 MPH. I would highly recommend the Petty Driving Experience to anyone, whether a fan of racing or not. It is quite simply a wonderful life experience. This is one of those rare times that I would advise each and every visitor to throw my old rule out the window, don’t even think about slowing down…just GO FAST!!! 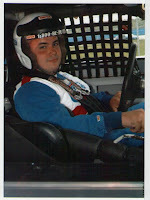 For more information you can visit the Richard Petty Driving Experience. How interesting! I don't know if I'll ever experience this, so thank you for sharing with us! !